It’s a valid discussion. We have always been vocal advocates for translating marketing materials into the local language of your target audience. This week: our perspective on translation, some of the most effective places to use it, and most importantly, why. This post is important for your team producing the materials and your higher ups who are questioning the rationale. Our goal: making you more capable, powerful, successful. Share away. Important to remember that translation is just one piece of the larger content customization process and that the content you share with your US audience will not resonate with your international audiences, whether you translate It or not. Each of your audiences are unique and will respond to different messages. Here's the thing you already know: marketing differentiation is all about speaking to your audience segments with the information that resonates. Seems obvious, but not many institutions take the time to do it. Instead, they blast the same stuff to every lead. And yet...they all complain and wring their hands about declining numbers and yield. There are solutions right there in front of you that do take more time and more investment. Take advantage of them sooner than later! To read more about developing audience personas and audience segmentation, see our post on Persona Development: 101 here. The Intead team does this targeted content strategy and writing for our clients to improve application flow and yield. Let's get to work together. A note on adding Google Translate to your site: not better than nothing. The nuance and specifics of your differentiators that your marketing department worked so hard to craft are absolutely butchered with Google Translate. Your target audience scans (not reads) pages translated via Google. They get the high level gist of it and move on quickly. There is no absorption of content because everyone knows you are losing a lot of accuracy. You'll understand more about all you are losing by taking this awful shortcut as you read on. An important perspective on translation: you don't have to translate ALL of your content, just some. You will achieve the goals we lay out below with a targeted and selective content plan for your major student recruiting markets. Let’s use China as an example here since it is the largest and most challenging recruiting region. Using the Chinese name of your institution and providing translated materials in the Chinese market shows a dedication to building your brand in the country. It shows your target audience that you are not throwing them the same content that you would give to an American or Brazilian audience. It demonstrates thought, kindness, and respect for their unique culture. Remember, your prospective students are not the only ones who will be reading your content. They have an entire network of connections with whom they will be discussing your institution and your academic programs. They may have young friends, siblings (not so much in China, but yes in other countries), cousins or other family members whose English is not up to par, yet… but that doesn’t mean that in a few years they won’t be ready for your institution. A strong referral is a powerful motivator, especially from friends or family. Remember that another key audience everywhere is parents. Parents who may not speak a word of English. Even at the graduate level in countries that have a strong family-orientation, parents often have a deciding vote. Give them the information they need in their local language to help their children choose your institution (perhaps over the other institution that did not bother to translate their content). Valuable side note: did you know we recently published a report on the most important decision-making factors for Chinese parents? What's on the Minds of Chinese Parents? A Research Report for U.S. Admissions Professionals on the Factors Swaying Academic Decision-Making is available as part of Intead Plus membership. A big thank you to Vericant for their invaluable help with this research. Vericant is a terrific resource in confirming English language skills of your Chinese applicants. Providing translated content allows for wider sharing and allows the reputation of your institution to spread, resulting in increased brand awareness and competitive advantage. All good things! Families all over the world are proud when their child is accepted into a higher education institution. On the golf course, at the local coffee shop, at the high school family night or parent-teacher meeting, the parents of your admitted students want to be in a position to express their pride in their child. With translated content, they know what they are talking about and can talk about your powerful academics, amazing campus, industry connections for students and so much more. Please don't keep this information from them by producing everything in English only. Give your international students’ families something to show to extended family, friends and anyone who asks (or doesn’t ask). Translate your rankings, your campus life information, your academic strengths. They want to be able to share your strengths – and you want them to! Your prospective students are often reading your content late at night after a long day. Make your content easy to read and understand – in their language. They will breathe a sigh of relief and thank you. They will associate positive feelings with your content. That's a great marketing approach. Consider this: when was the last time you saw a marketing department put a barrier between you and the marketing language they want you to connect with? Kinda defeats the purpose. Let the English language tests and the rest of your admissions process ascertain your prospective students' English language skills.. not your marketing materials. Translation for international social media can be particularly influential because of the nature of social media as a whole – designed for content sharing! Allow your students the opportunity to share your posts in their local language, whether as simple information sharing, bragging rights or event invitations (webinars, fairs etc.). The same logic applies to any in-country social media advertising. 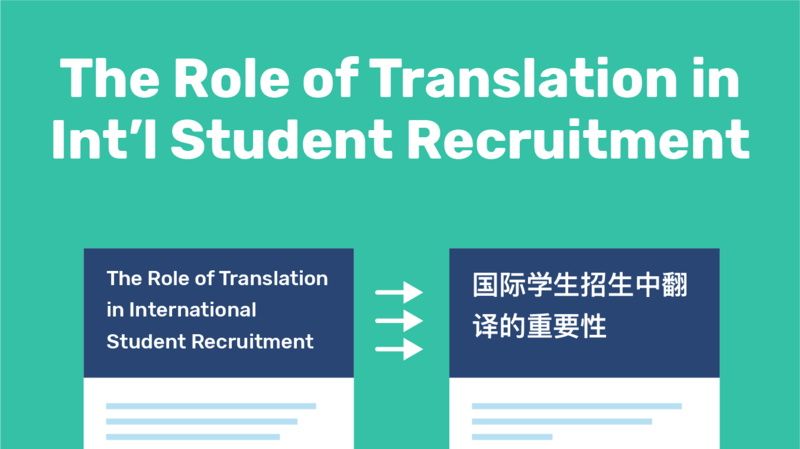 Translation simply allows you to cast a wider net and build your brand reputation among a wider audience that might not be ready to enroll right now but might know someone or might want to enroll in the future. Obvious brand building. Many institutions have built dedicated “microsites” within their larger site to house all information relevant to a particular prospective student group. This can be an incredibly powerful tool to build in-country brand awareness – if your audience can read it. Translating the content within your microsite allows your prospective students to access and share all relevant information with their network. Providing print materials for agent offices shows respect for the agent’s local culture and fosters positive feelings of connection that might not be present for institutions simply providing generic English language content. This nurturing of the agent relationship may just get you that right fit student that you’ve been seeking! Another advantage to translated materials for agents or fairs is again, simply the ability to share the information with a broader audience. A print flyer can travel fast through friend groups and family networks, if it is relevant, accessible and just feels right to the audience. Translation is one step toward that goal. Bottom line: The end goal with translation, really, is casting a broad net and building your brand reputation in country. What materials do you translate at your institution? Any? Why or why not? Let us know in the comments.